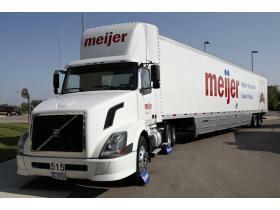 Meijer is one of several fleets participating in the Clean Energy Coalition's Green Fleets Project. The project is designed to displace and reduce more than 5 million gallons of fossil fuel and 500 million pounds of vehicle emissions. Sep. 7, 2009 · 8:41 p.m. Phones have been ringing off the hook at Ypsilanti’s Clean Energy Coalition since it was awarded a $15 million grant from the U.S. Department of Energy. The Ypsilanti non-profit, committed to promoting clean energy technologies, won the grant for its Michigan Green Fleets project. Executive Director of CEC Sean Reed said the project - in simple terms - is supposed to displace and reduce more than 5 million gallons of fossil fuel and 500 million pounds of vehicle emissions over the project’s four-year life cycle. But Reed said the actual amount of fuel savings would be greater than what was calculated in the proposal to the DOE. “Whether it’s a vehicle or a fueling station, it probably has a life cycle of at least 10 years, which is much higher than what’s calculated,” Reed said. The Michigan Green Fleets project will assist nine project partners in purchasing 271 alternative fuel vehicles, including hybrids and compressed natural gas (CNG) cars, trucks and buses. The Project will install 19 alternative fueling stations in multiple sites across the state of Michigan. The grant is part of a $300 million Clean Cities program outlined in the Federal government’s Recovery Act of 2009. The award will be matched by an additional $16 million in funds provided by project partners for a total $31 million investment. Project implementation partners include: State of Michigan Department of Energy, Labor, & Economic Growth’s Bureau of Energy Systems, Greater Lansing Clean Cities, Detroit Clean Cities and West Michigan Clean Cities. Participating project fleets include: Mass Transportation Authority, Interurban Transit Partnership (“The Rapid”), City of Ann Arbor, Meijer, FedEx Ground, Ann Arbor Transportation Authority, DTE Energy, Forest Hills Public Schools and the University of Michigan. Reed said since the project was announced his office, at 44 E. Cross St., has gotten dozens of calls and emails form other area organizations asking how they can be involved in the program. The $300 million DOE grant is designed to put more than 9,000 alternative fuel and energy efficient vehicles on the road, and establish 542 refueling locations across the country. The DOE also estimates they will help displace approximately 38 million gallons of petroleum per year. Approximately 25 awards were given for state, multi-state and regional projects. The City of Chicago was awarded nearly $15 million to deploy 554 alternative fuel and hybrid electric vehicles and install 153 alternative fueling and electric vehicle charging stations throughout the Chicago region, among other initiatives. Reed, who has been working on the Clean Cities project with the CEC for several years, said he couldn’t be more excited about the project. “This was probably the biggest projects we’ve tackled,” Reed said. “The report was about 120 pages long and had about 20 different files. To view an entire list of the Clean Cities Recovery Act awards click here.